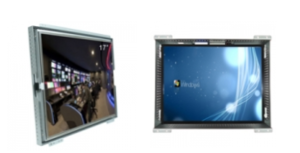 Crystal Display Systems LTD (CDS), the leading designer, distributor & value-added reseller of flat panel display solutions, have launched Ruggedised PCAP Touchscreens and Monitors without the Ugly Copper Wires! With the development of CDS's PCAP touchscreens and the ability to work through up to 6mm of glass you no longer have to accept the ugly copper wires that inhibit contrast and viewability for the user on your Displays and digital signage. You no longer have to accept second best with CDS's "Rugged-Vue" ITO PCAP touchscreens. Their multi-touch sensors are typically constructed on a 1.2mm substrate allowing a sacrificial 6mm cover glass, meaning they are durable enough to withstand most impacts and extreme applications. This technology will detect fingers, conductive stylus and even some gloved hands, through glass thicknesses of 10mm or more. Yet, it ignores raindrops, leaves, dirt, ice, etc., making the touch sensors ideal for Industrial machines, vending machines, Self Service Kiosks and for use in public areas, i.e. in most environments. With excellent durability, the "Rugged-Vue" provides 24/7 functionality in the most difficult of environment, minimising system downtime, reducing maintenance and maximising return on system investment. Exceptional Optics via ITO PCAP touch (no copper wires visible) available up to 6mm glass cover lens with drift free touch coordinates using finger, certain glove or passive pen input. The monitors can operate in environmental extremes - temp range -40 to +85 degrees centigrade. Custom Coverglass available as an option (details upon request or email CDS your coverglass requirements). The technology is proven, dependable vandal-resistant and is practically immune to many types of abuse, and is a much lower cost than the older copper wire technology you see glistening in the sun and affecting viewability etc. If these displays are of interest to you and your company, please contact CDS' highly experienced and trained team of sales staff who take care of any enquiries. Their unbeatable technical team work closely with customers regarding installation and service worldwide. Or to simply find out more information about this product please visit http://crystal-display.com/products/open-frame-monitors/ and to request data sheets please contact the team via email [email protected] or call the UK main office +44 (0) 1634 327420. With the development of CDS's PCAP touchscreens and the ability to work through up to 6mm of glass you no longer have to accept the ugly copper wires that inhibit contrast and viewability for the user on your Displays and digital signage. You no longer have to accept second best with CDS's \"Rugged-Vue\" ITO PCAP touchscreens. With excellent durability, the \"Rugged-Vue\" provides 24/7 functionality in the most difficult of environment, minimising system downtime, reducing maintenance and maximising return on system investment.